It seems incredible, especially since many enigeers swear that this is impossible. Below are some well known transports that have strong sound characteristics. 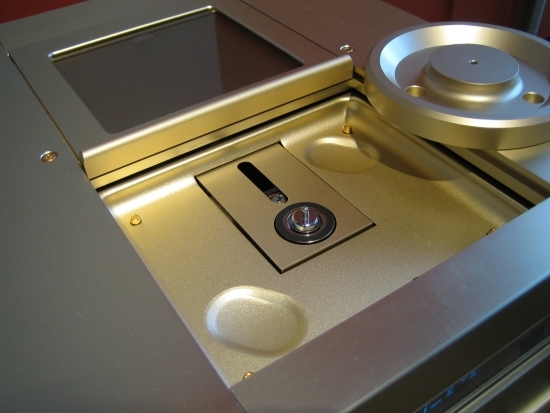 Above: an older audiopile favourite, the Teac T1. This machine is well-built, reliable and sounds excellent. It is still around on the second hand market and good value. It uses the simplest VMK-4 VRDS transport of the time. One that is also used by entry level models of highend brand Wadia. 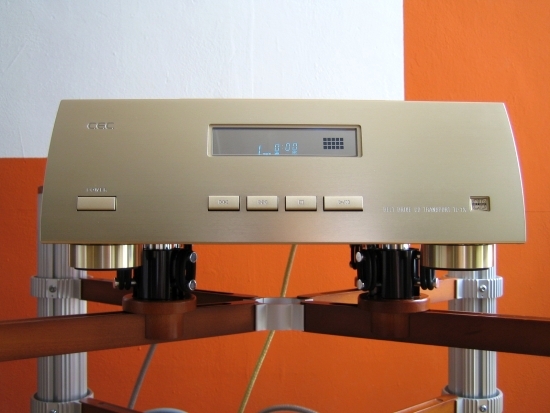 That is probably why audiophiles like this machine; it is almost Wadia on the cheap. It certainly looks the part with its sturdy-looking centrally placed VRDS transport and separated powersupply, digital section and output stages. As you can see above however, this transport is actually less robust as it first appears. (picture taken from www.lampizator.eu) The sturdy looking bridge is actually just a plastic cover – for looks. Under that is a simple pressed steel plate and a standard brushed motor. The green stabilizing platter is made from plastic, not metal and it is very lightweight and wobbly. 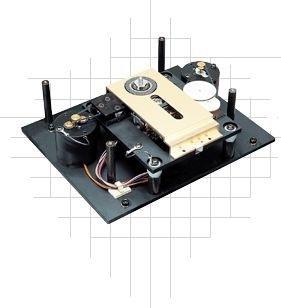 This top section is the only part made by Teac. The rest is standard Sony, top-bottom reversed here and there. The motor went up, and the disc clamp went down. The laser is also standard Sony. 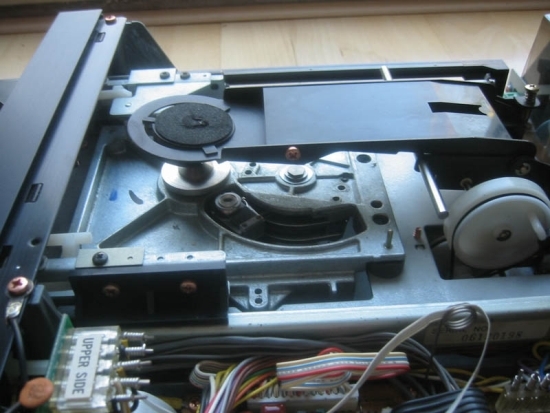 My friend Niels has a Teac CD transport with the same mechanism as is used above and in spite of the deceptively lightweight construction, it actually has some strong qualities normally associated with Wadia CD players and transports. Just to find out what would happen, he removed the plastic platter in such as way that CDs could still be played and guess what? Most of that typical Wadia-boldness was now gone, replaced by a more upbeat but also more lightweight and less colourful sound. I stumbled across the above inside pictures on another website and was amazed by the descriptions found there. (http://www.lampizator.eu/lampizator/REFERENCES/TEAC-T1/VRDS-T1.html) After reading this report I just couldn’t correlate it with my own findings. 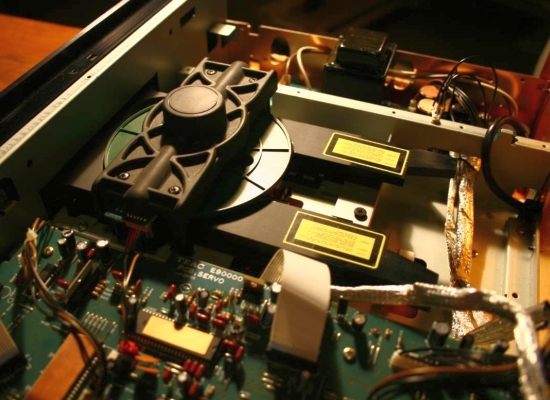 I’ve heard this mechanism (my friend Niels has a similar Teac player with the same mechanism) and it still sounds much like a Wadia transport! Don’t ask me how this is possible, seeing as everything else is Sony-made. Even the servo. But I swear: this thing does not sound like a Sony. I’ve had several Sony players and heard even more and you can always tell that it’s a Sony. Normally you can easily distinguish a Sony transport by its airy, agile and slender sound s well as sounding slightly mechanical. All Sony transports and cd player that I’ve heard had these characteristics. The Teac T1 sounds completely different: it is full, warm, solid, slightly dark and natural sounding. In fact, it reminds me a lot of how the Wadia transports sound. I’ve had several Wadia’s that used a similar transport and their sound has a lot in common with this Teac T1. It also has the VRDS tradeoff that the player has to run warm for a couple of cd’s every time, even when you leave it switched on 24/7, before it sounds its best. So is this difference caused only by the fact that the motor is upside down and that the disc is covered by a green plastic platter? I don’t know, but even though you might feel ripped off after seeing the pictures above, this is still an excellent player. But don’t forget, this is only the cheapest VRDS transport available. There are much better ones further down the line that do have a full cast-metal bridge such as the CMK-3.2 and the improved SE version. And of course there is the current all-out assault in the shape of the VRDS Neo. Above: Meridian 602. This was their reference transport at the time and it sure looks very chic. It also operates very smoothly; the drawer is both quick and silent. It uses the Philips CDM-4 transport, which is a more economical descendant from the CDM-1. It is still made from cast metal and it also sounds excellent but clever rethinking made it possible to reduce the amount of material used. A discription of the 602 sound can be read further below. Above, on top of the rack: Marantz CD94MKII. It uses the CDM-1MKII transport. Since I had this player at the same time as the Meridian 602, I could easily compare the players. Of course I used the digital output in order to listen only to differences in transport. 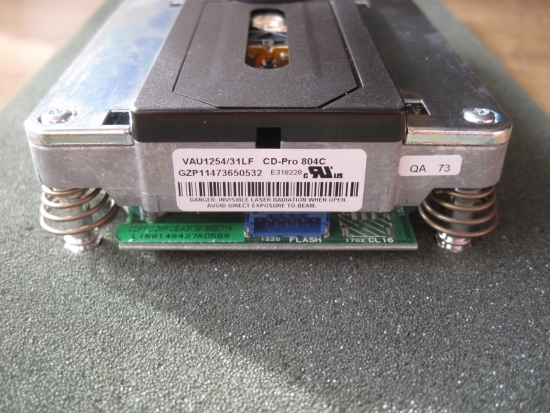 Above: the CDM-1 transport inside a Philips CD960 CD player. The same transport (and also a large portion of the electronics) are used in the Marantz CD94 and CD94MKII. I’ve owned 2 Marantz CD94MKII’s, a Philips CD960, 2 Philips CD880’s and many other cd players that use a CDM1 as well as players that use the CDM-4 such as the Proceed PDT3, Krell KPS20i and the Marantz CD16. And I’m sure I left some players out. I guess you could say that I know a bit about these transports:-) As such, I am very familiar with their sound. The old swing-arm mechanism is in fact an excellent mechanism. It was used by many highend brands until it was taken out of production because it was getting too expensive to make. After that many brands were forced to start using the el cheapo CDM12 mechanism in its many guises. Granted, the CDM12 was far from bad, but it’s in a different league than the old swing-arm mechanisms. What all Philips swing-arm mechanisms have in common are very subtle and fluid highs. The treble is so very smooth and velvety and the sound in general so natural and free flowing that this transport is often solely responsible for any given player to sound “analog”. It doesn’t matter which brand you listen to; if tthe CDM1 is inside, it can never be an aggresive sounding player. Just why that is is unknown to me. I can imagine that the magnetically driven lens assembly is very free in its movement, unlike modern plastic worm-wheel mechanisms and the lens was made from glass instead of plastic. The strange thing is that the 602 sounded mediocre at best. Sure it was subtle and never aggressive, but it sounded slow, rounded off and undynamic. I’ve heard this before in an older Marantz CD94. I think it is because of age. Transports do age and may start to produce more jitter or otherwise start to go off spec. Whatever the cause, it is important to note that once you’re comparing 10 year old transports, that age becomes a factor. I hope that this was also the case for the Meridian 602 because it was simply completely bettered by the Marantz CD94MKII on al accounts. 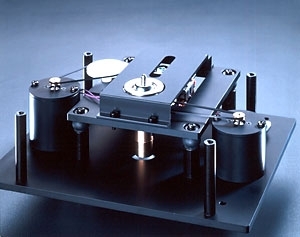 Above: the beautiful CEC TL1x Belt Driven CD transport. 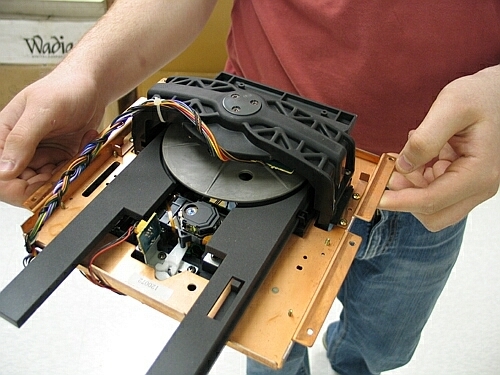 Not only the rotation of the disc is done by belt, but also the movement of the lens assembly. The use of rubber belts, heavy platters and contraweights in a digital player is controversial to say the least. For one, cd’s rotate at varying speed. Fast at the beginning and slow at the end as opposed to constant in a record player. 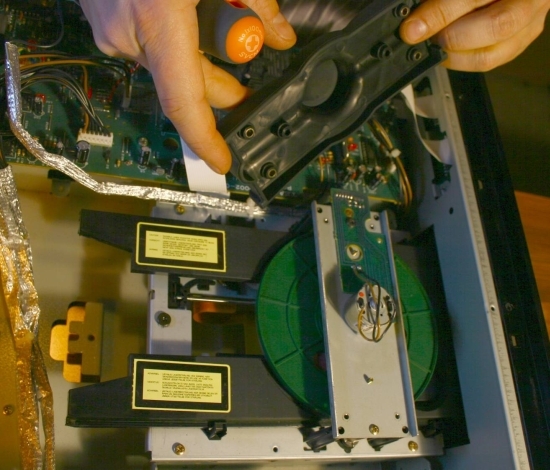 This is why a contraweight is perceived as unneccesary and even unwanted in any disc reader. Rubber belts on their turn prevent the player to react quickly to changes in speed thus making the transport slower in response to starting up and track skipping. But according to CEC, these downsides are outweighed by the advantages which include less vibration transfered to/from the disc. But the proof of the pudding is in the eating. The CEC sounds incredibly fluid and smooth, yet is very expressive, fast and dynamic. It bests the Marantz CD94MKII (CDM-1) in detail, focus, soundstage width and overall smoothness but the CD94MKII is actually a bit more fluid in the highs while being more dry overall. The treble is drier but also more fluid. I know that sounds contradictory but this is how I hear it. The CEC is more continuous but hi hats can be somewhat more coarse than on the Marantz. The CEC is my reference cd transport. 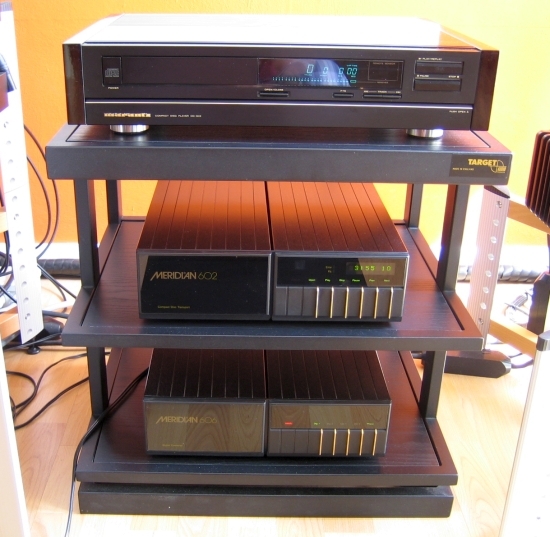 The original CD Pro and CD Pro 2 are well known mechanisms and they have been used in a plethora of players such as Mark Levinson and Audio Research to name just two. Originally made by Philips themselves, the transport was produced under license by another company the name of which I can’t recall. You can distinguish the two by the Philips brand either being printed on the side, or left out. 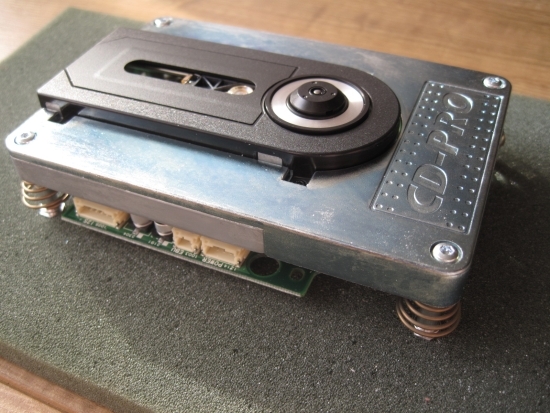 The above CD Pro 2 is a later non-Philips model. This is the transport that replaced the ageing original Philips transport in my Mark Levinson 390S CD player. This change brough a very welcome improvement in PRAT, or to put it more precisely in terms of speed and dynamics. 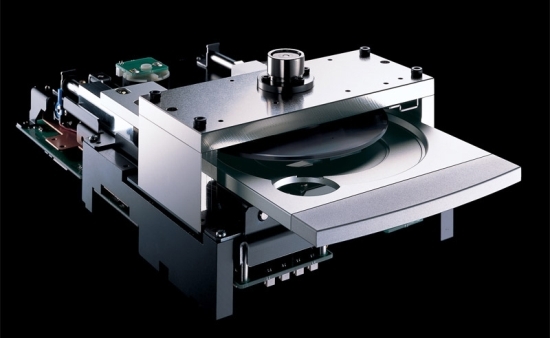 In spite of its heavy looks, the CD Pro itself is not a super high end mechanism at all, but a very decent mechanism nevertheless. That it is one of the very few CD only mechanisms still available no doubt has helped in its success. 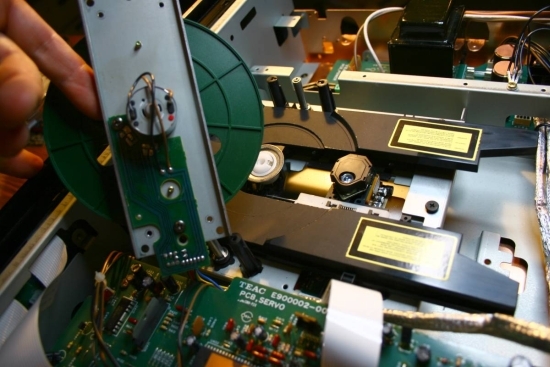 Unlike the Teac (Sony) CMK 3.2 and Philips CDM1 and CDM4, the CD Pro mechanism does not have a long lifespan, usually lasting only 10 years. The interesting thing about the CD Pro 2 however is that it is like a chameleon: it doesn’t have a specific sound and the end result can vary anywhere between smooth and clinical depending on the application. So why do transports sound different? This is also controversial and I can understand why. If the quality of any digital signal depends only on timing, why should different feet give a different sound? Well, maybe it influences the way that vibrations are conducted to the inner parts of the player hence causing the laser to mistrack. Or maybe there’s more to it than that. But I do know that feet make a large difference to the perceived sound. Soft rubbery feet make the sound soft and slow and hard cones make the sound more delineated and improve transient response. This will hopefully not come as a surprise to you by now. After all, if you were a cynic you probably would’ve stopped reading by now:-) Indeed, power cables make a difference, even when connected to a transport. Why? I presume this is because they influence other components connected to the same extensionblock but this is just guessing. Digital interlinks also have an influence on sound by the way. With certain cables you can make the sound faster and more dynamic or gentler and more fluid with other cables. Don’t assume that 1’s are 1’s and 0’s are 0’s. Of course they are in principle, but here, timing is everything, and apparently the timing can be disrupted by cables. Transports really do have their own sound signature and this is easy to hear. Look for differences in speed, attack, dynamics and fluidity. The differences are indeed not super-large, but absolutely clearly audible and, the CD Pro 2 aside, it is comforting to find that the mechanism’s inherent sound characteristics are usually audible regardless of the player brand that they are used in. An interesting article that was going very well until the author lost all credibility by claiming differences in power cables. Do people realise the damage it does to their reputation. No one, I repeat, no one has ever been able to identify a difference in power cables. I will happily bet my house for the author’s house (all properly and legally agreed through solicitors), if the author can identify a power cable difference in a properly controlled test – a challenge no one has ever accepted. It is a shame that someone providing such useful information discredits themselves in the final furlong. Hi Stevie, Meanwhile I have an idea why I hear differences between power cords even with CD transports, and I added this to the review. Differences between power cords in general are easy to hear. Especially when comparing a very smooth sounding cable such as a Furutech FP-TCS31 with a very clean sounding one such as a Belden 19364. If you agree to visit some day then I’d be happy to do a blind test with you. You can swap the cables and I’ll try to identify them. Actually I’ve already done plenty blind tests and have also tried to trick friends, to no avail. The only thing I am not sure about is WAV vs FLAC. Sometimes I think I hear differences, other times I can’t distinguish them. Of course, mathematically they should be identical. But real-time conversion inside a streaming endpoint is something else than controlled offline conversion on a computer and the results need to be 100% the same (but they might be). My point is that there may always be explanations that you just did not think of at first. In any event: I’m not making this up. 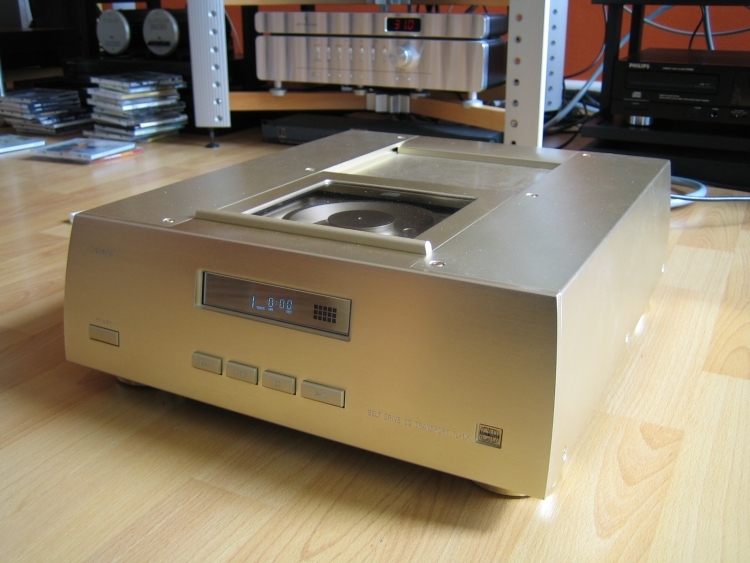 Great annylis of the old CD players and mechanics…..do you really choose a golden oldie over a current , positively reviewed machine ..? Because HiFi Voodoo make it possible. Digital data flow do not care the transport. If you think it does, better visit some psychiatrist. I understand why it would seem obvious that they wouldn’t. But if you’d just compare a couple for yourself, then you’d hear that they do. Yes, the data is digital, but it is being read in an analog fashion. There are certain variables in the readout process and we all know what jitter contributes. That’s the only well-known issue with digital that we have discovered so far. Who knows what parameters we will discover next?